This Dua is very powerful is someone Illicit or unlawful possession on houses, plot or property then you can read this Dua. 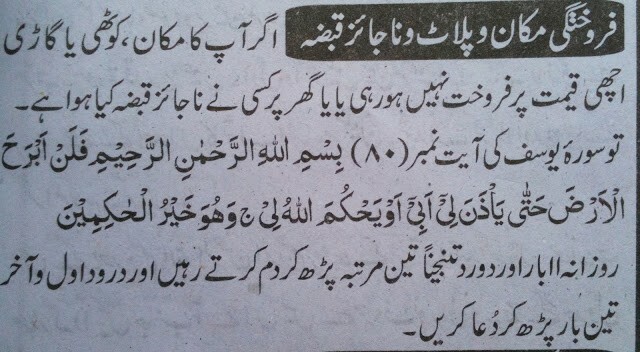 You can also read this Wazifa if no one want to buy your property and you are in hurry to sell, or you want to sell your Vehicle then you also do this Wazifa Inshallah your wish fulfill soon by grace of Allah. If you know Urdu then please follow as written on image but if you do not understand Urdu language then please do follow as written below. You have to read Sorah-e-Yousaf Ayat no 80, 11 times daily and before and after 3 times Durood-e-Tanjainaa and Braise notional or Imaginary Dam on that thing for you did Wazifa. i do not understand,,, i must read surah-e-yusef ayath no. 80, 11 times daily then what?? ?